Award-winning smart beehive project is a unique platform to monitor honey bees remotely and in real time, within the hive. Honey bees have throughout history been a keystone species, pollinating an estimated 70 percent of all plants and underpinning some 30 percent of the global food supply. 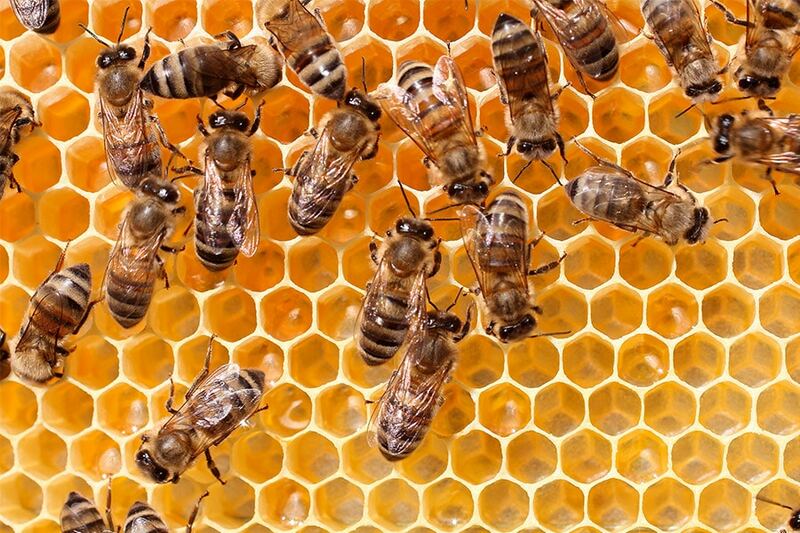 Because the viability of beehives is a critical predictor of the planet’s future health and agricultural sustainability, reports of a precipitous decline in the number of colonies around the world have stirred considerable alarm. Global warming has accelerated the growth rates of damaging pathogens such as mites, viruses and fungi. It has also seriously upset the natural rhythms adapted to by bee populations over centuries of previously consistent seasonal weather patterns. Pesticides used in crop production are ingested and transmitted back to hives via bees during pollination, resulting in the spread of damaging disease, weakening and very often the total collapse of colonies. Increased atmospheric electromagnetic radiation associated with exponential growth in the numbers of cell phones and wireless communications towers is believed to interfere with the bee’s ability to navigate in flight. Researchers understand that any meaningful response to these environmental changes and potentially related threats will first require analyzing conditions within bee colonies. The challenge is, of course, that honey bees are extremely protective of their hives and virtually impossible to monitor at night or during inclement weather. A group of biology, food business, and embedded systems engineering students at University College of Cork in Ireland recently took up the challenge, developing a unique platform through which they are able to monitor, collect and analyze activity within the colonies unobtrusively and on a unique scale. It so happens that Saint Gobnait, the patron of beekeepers, who is originally from County Clare, Ireland, is depicted in a stained glass window in the Honan Chapel located near the University College Cork campus. Dubbed “(2B) OR! (2B),” the UCC “smart beehive” project, which was awarded top honors in the IEEE/IBM Smarter Planet Challenge 2014, deploys big data, mobile technology, wireless sensor networks and cloud computing to record and upload encrypted data. The students used as their starting point Waspmote, a modular hardware sensor platform developed by Libelium that can connect any sensor network and wireless technology to any cloud platform. The UCC team integrated gas and hive condition sensors, ZigBee radios, 3G and GSM communications to look at the impact of carbon dioxide, oxygen, temperature, humidity, chemical pollutants and airborne dust levels on the honey bees. Data from initial observations of the project were captured in two scientific papers and three invention disclosures with smarter hive features and experiments currently being carried out at the UCC Embedded Systems Laboratory. A second deployment of the UCC “smart beehive” is planned to further study sensor combinations used in the first phase. All data will be made available. PhD candidate Fiona Edwards Murphy spearheaded the group project, co-supervised by Dr. Popovici and Dr. Padraig Whelan, of the school of Biology, Earth and Environmental Sciences (BEES) at UCC. “If the bee disappeared off the surface of the globe then man would only have four years of life left,” a quote often attributed to Albert Einstein once warned. “No more bees, no more pollination, no more plants, no more animals, no more man.” In 1901 the prominent Belgian writer Maurice Maeterlinck published “The Life of the Bee,” and helped to popularize the idea that the bee was a vital ecological linchpin. The work was originally written in French. Maeterlinck provocatively suggested that we owed our civilization to the bee, that readers might conclude that the extinction of the bee would lead to the collapse of civilization. What neither Einstein nor anyone else could not predict was the use of smart technology to integrate beehive sensors and digest the data they collect. Such platforms have a critical role to play not only in ensuring pollination but, ultimately, in monitoring, understanding and managing precious global resources of all kinds. 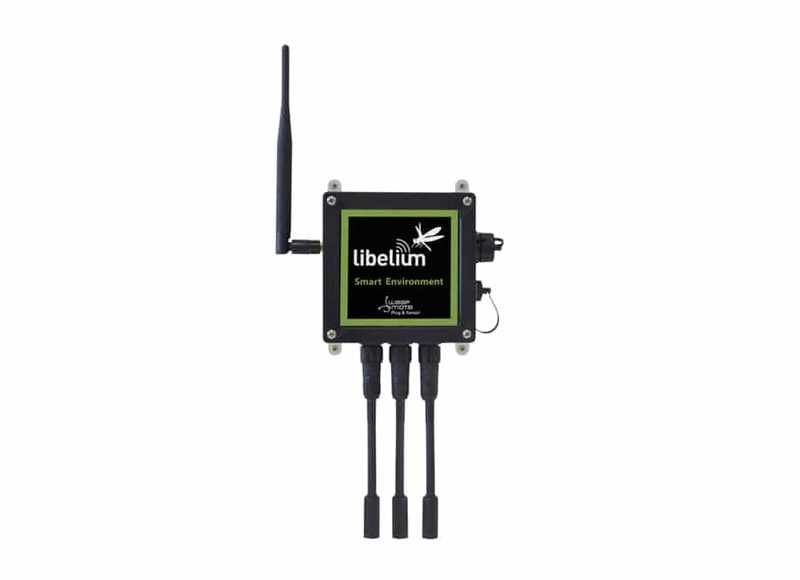 For the engineering study, the group selected Libelium’s Waspmote wireless sensor platform because of the wide range of sensors available. Waspmote Plug & Sense! 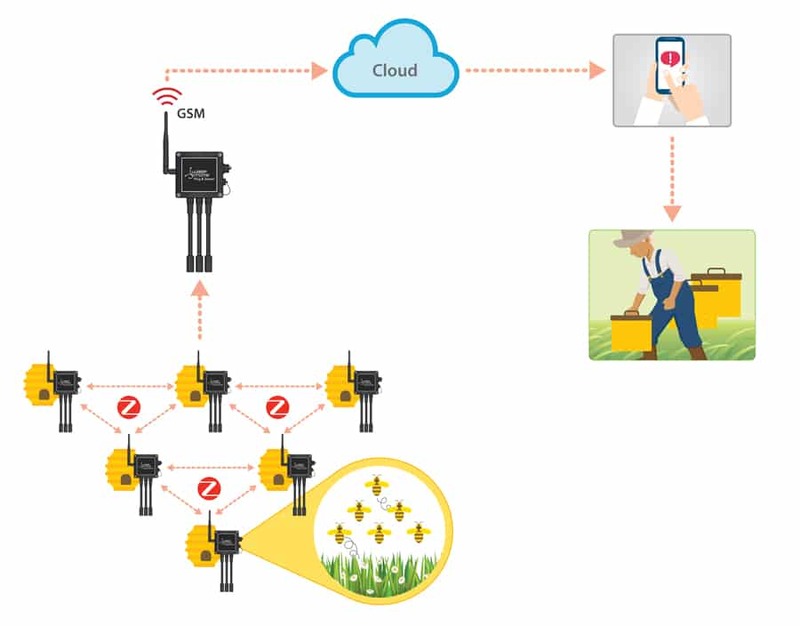 sensor nodes integrate more than 70 sensors, adapting to any wireless sensor scenario such as air and noise pollution, irrigation control, livestock tracking, vineyard monitoring, water quality, etc. With its waterproof enclosure, Waspmote Plug & Sense! is suitable for outdoor deployment, and sensor probes are easy to add or change. Another requirement for the honeybee project was the ability to harvest energy, and the Waspmotes installed are energy neutral with solar panels that allow the nodes to work autonomously for years, thanks to Waspmote’s extreme low power consumption. It was important that the sensor node fit inside the beehive, without impeding activity of the beekeeper and to avoid any interference with the bees. 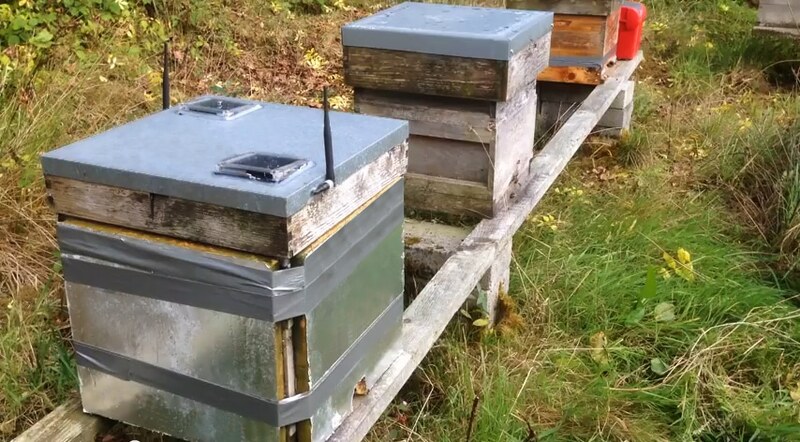 Waspmote nodes installed in the beehives measure CO, CO2, O2, temperature, humidity, chemical pollutants (NO2, H2, NH3, Toluene, Isobutane) and airborne dust, all important indicators of the health of the bee colony within. One objective of monitoring is to send important real time information directly to the beekeeper; another is to collect data for analysis, and to build a database that enables partners in biology to study pests and diseases. 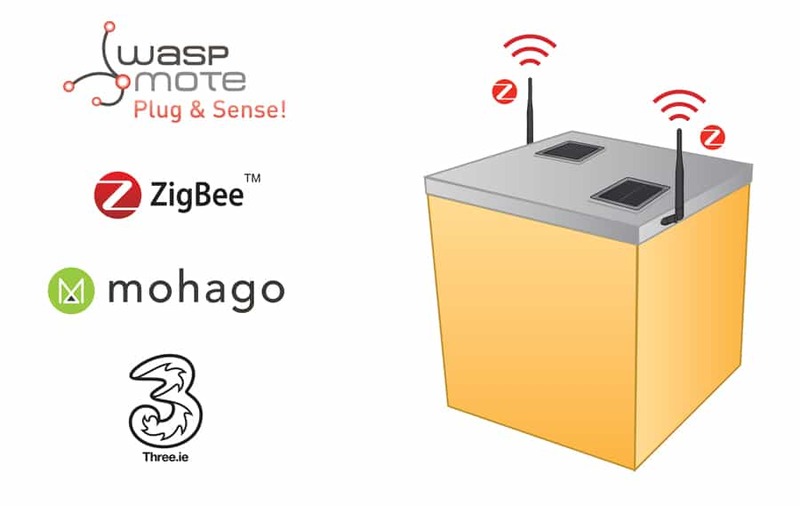 The sensor nodes communicate via Zigbee and form a network. A gateway node or Meshlium multiprotocol gateway receives the sensor data for transmission to the Internet – the Cloud—via Ethernet, Wi-Fi or 3G/GPRS, depending on available connectivity. The sensor data collected at the hive is readable on mobile devices, PCs, smartphones or tablets, and can be integrated into maps or geographic information systems (GIS), or easily imported into third-party applications or databases for analysis. 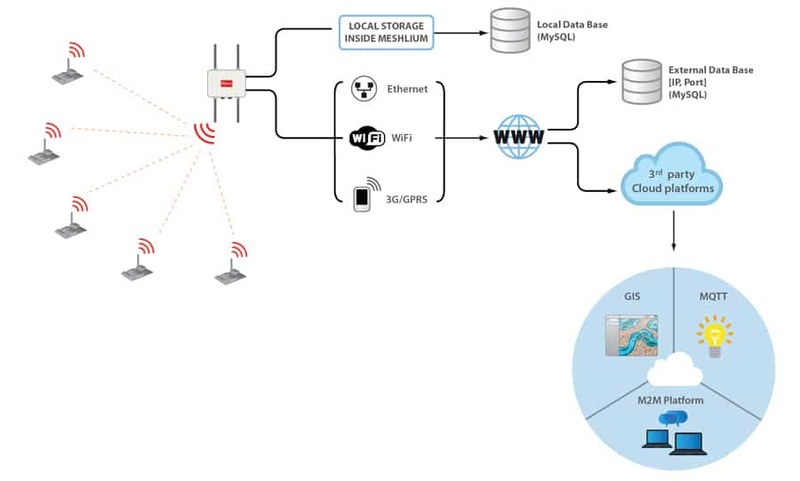 Wireless Sensor Networks (WSN) blend high connectivity, low power, and interoperability with electronic devices and diverse data systems. Great insights! That’s the answer we’ve been looking for.